The Tioga Pass Road, located about 25 miles from Mammoth Lakes, runs through is the highest highway pass in California and serves as the eastern gateway to Yosemite National Park. Along the way, drivers are treated to some of the most beautiful alpine scenery in all of California. Splendid amenities in charming accommodations at Tioga Pass Resort. Year-round activities at an elevation of 9,641 feet. Rustic cabins & motel rooms. The Tioga Pass Road takes about two hours, each way, to drive. Located approximately 25 miles north of Mammoth. Highlights include views of beautiful alpine lakes, scenic meadows, and views from Olmstead Point. This is the highest highway pass in California at 9,943 feet. At 9,943 feet, the Tioga Pass is the highest highway pass in California, and the eastern gateway to Yosemite National Park. And State Route 120, the road that runs through the pass, treats those who drive it to some of the most breathtaking scenery in the world. Take note, this road generally closes around November and re-opens in May or June. From Mammoth Lakes, begin by heading north on US-395 for 25 miles. This portion of the trip is part of another scenic drive, The Eastern Sierra Scenic By-Way, and it has many unique sights of its own. After 25 miles, turn left onto CA-120/W Tioga Pass Rd. This road will take you up and over the Tioga Pass. Our recommended route is 55 miles, beginning at CA-120’s junction with US-395, and continuing for 55 miles to the roads terminus at Crane Flat. Because it's a windy mountain road, allow at least two hours to complete the drive, one way. The road passes many beautiful alpine lakes including Saddlebag and Ellery. Hikers take note; the road crosses directly over the famed Pacific Crest Trail. If you want to break up the drive, there are many scenic campgrounds located along the route. The road passes through Tuolumne Meadows, one of Yosemite’s most famous attractions. 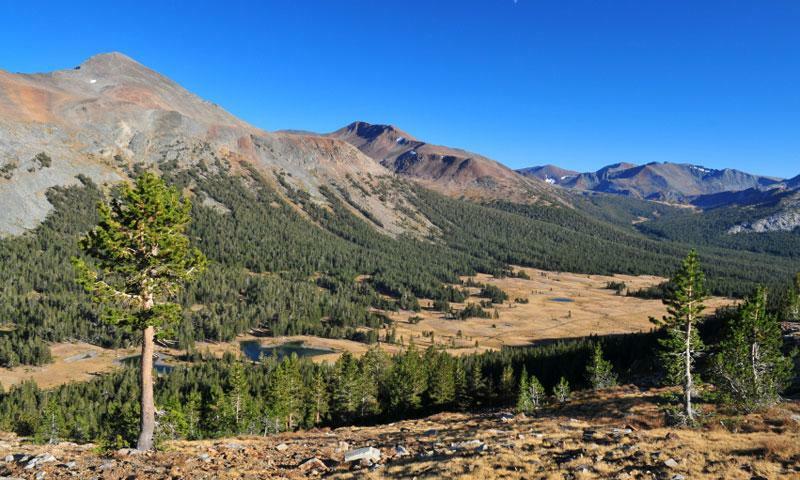 Enjoy some of the best views in the Sierras from Olmstead Point.